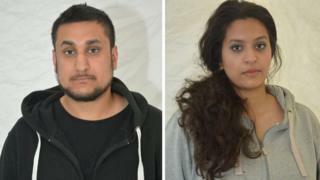 A husband and wife have been found guilty of plotting a terror attack in London ahead of the 10th anniversary of the 7 July bombings. Mohammed Rehman, 25, discussed targeting the London Underground and Westfield shopping centre on social media under the name "Silent Bomber". Chemicals for bomb making were found at his Reading home, the Old Bailey heard. He and his wife Sana Ahmed Khan were convicted of preparing terrorist acts. They will be sentenced on Wednesday. Rehman, who was also convicted of possessing an article for terrorist purposes, used Twitter in May to ask for suggestions on which target in London to choose. With money supplied by his 24-year-old wife, he stockpiled the chemicals needed to make a huge bomb at his family home in Reading and even filmed himself setting off a small explosion in his back garden. Image caption Photo of Rehman's tweet saying a homemade explosive was his "key to paradise"
During his trial, jurors heard a tweet sent from Rehman's account said: "I've rigged my house to blow at the push of a button by my bedside if the popo [police] try to raid man. Nobody gets in the way of my jihad." An undercover investigator discovered Rehman had asked on social media whether he should target "Westfield shopping centre or London Underground". Rehman told the investigator he was planning a martyr operation, jurors heard. His trial was told that Rehman was prolific on Twitter, posting extremist rhetoric alongside images of homemade devices and instructional material. Media captionMohammed Rehman's mother: "I still can't believe he is my son... I doubt I'll ever forgive him"
In one tweet, on 12 May 2015, he wrote: "Westfield shopping centre or London underground? Any advice would be appreciated greatly." Text messages between the couple were uncovered showing discussions about buying chemicals, while emails revealed Rehman had also sent Islamic State-related video clips to Khan. Speaking after their conviction, Assistant Chief Constable Laura Nicholson, head of the South East Counter Terrorism Unit, said: "These were dangerous individuals who represented a genuine threat, but through counter-terrorism policing we were able to intercept them before they could carry out their plans. "It is clear that Rehman and Khan shared a radical and violent extremist ideology. They actively accessed extremist material on the internet and used social media to develop and share their views as they prepared acts of terrorism." Rehman's parents told the BBC's Duncan Kennedy they had seen no sign of any connections with radical Islam, although they said their son did become isolated and was smoking and drinking in the months before his arrest. His mother said she would "never forgive" her son for planning the attack. His father, who moved to the UK in 1980, said he had "no idea" his son was carrying out test bomb blasts.